At the far western end of the Himalayas in the Kohistani region of Northern Pakistan -- close to the border with Kashmir -- looms the massive Nanga Parbat, the ninth highest mountain on earth. Nanga Parbat, Kashmiri words for "Naked Mountain", is so named because its sides are too steep to allow snow to cover it completely. 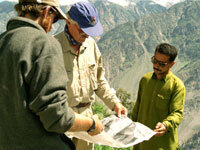 30 years ago, a young Pakistani geologist, Qasim Jan, went to the Kohistani region to chart its geology. His study began an international inquiry into the nature and history of Nanga Parbat, eventually leading to discoveries that have changed geological theory forever. After decades of work, an international team of scientists came up with remarkable results. Nanga Parbat was revealed to be extraordinarily young, existing for only 1-2 million years. It is eroding at a spectacular rate due to glaciers, the Indus River, and immense precipitation, yet at the same time it is growing faster than any other mountain on Earth. More importantly, its high growth rate is directly due to the erosion it endures. The film follows the scientists through each step of their research and revelation, allowing us to share their interest in this fascinating mountain and enabling the viewer to fully understand the geological principles behind their discoveries. "This outstanding video follows scientists through their individual and collaborative researches to understanding the unique phenomena of this mountain's development...[a] superbly produced, visually stunning, 'viewer friendly' documentar[y] that [is] enthusiastically recommended for community libraries, science video collections, and school classroom curriculum supplementation." "Fascinating, extremely well-produced...[NANGA PARBAT:NAKED MOUNTAIN] advances discoveries that will forever change geological theory. Arguments are clearly illustrated through excellent computer modeling. This detailed, complex video is recommended for college classes in earth science, environmental science, geography, and geology..."